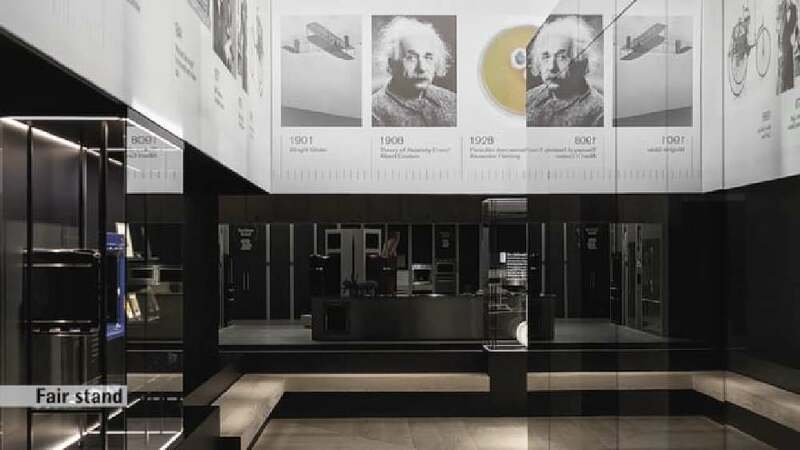 Celebrating 333 years of existence, German household appliance manufacturer Gaggenau presented itself at the EuroCucina 2016 with an extraordinary fair stand concept expressing the motto of “333 years in the making”. Visitors were invited on a journey that took them through the history of the company starting with its foundation back in 1683. Established as a forge in the 17th century, the journey covered milestones in the evolution of the company as staged pieces of art and framed by projections of the world history of fine arts and engineering. The journey culminated with the unveiling of the EB 333, a relaunch of the company’s 90 cm wide oven. For visitors, it represented the transition to the heart of the fair stand – a futuristic glass cube with a bright purist interior for presenting both the manufacturer’s latest product portfolio and thus the brand itself. The products by this manufacturer exude an air of the unobtrusive and self-reliant. The fair stand with its black cube embodies this characteristic to impressive effect. Featuring a strong overall poetic design, the chosen presentation approach successfully manages to present the products in the best possible way. Each product is beautifully staged, eliminating anything that might distract from it. The level of control and the level of design realised in this fair stand are exceptionally strong.